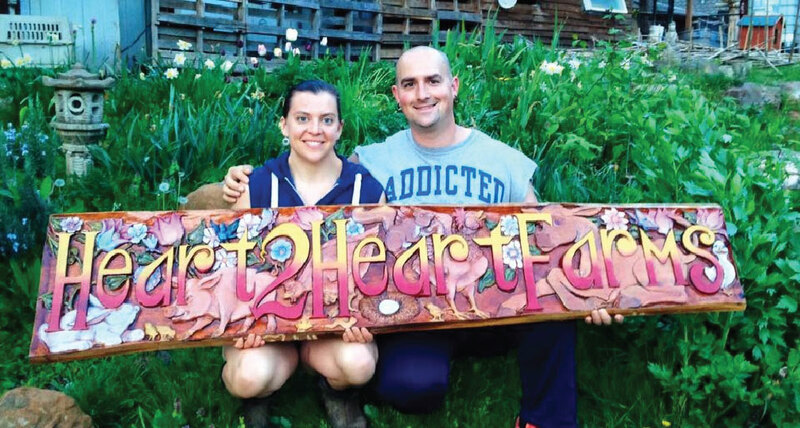 Nestled on a steeply sloping hill, not far from Portland, sits Heart 2 Heart Farms. Upon arrival you might mistakenly think it is a throwback to the hippie era. First glance produces an array of terraces, cages, dwellings, animals and gear that make you pause to try and figure it all out. Forget that, it’s easier to take a tour and be amazed by what unfolds as you amble through the reclaimed wilderness. What started as an idea to grow only organic food in the middle of the urban forest has turned into something that perhaps owner Tyler Boggs never imagined, a repurposed sustainable compound that is literally living up to his expectations. The multiple terraces, sheds and animals along with a good amount of repurposed human things appear haphazardly but with Tyler explaining how it all works together you can see the purpose, well maybe, but the farm is based on something that has relatively new yippy words like permaculture. A technique whereby you think a lot about how to do something so that it can work with as little effort as possible, a paradigm to most farms of today. Disheveled young people, in boots and clothes no better than Portland’s homeless, quietly work the farm. Each has come to learn, each brings their own skills. They come from Egypt, England, and places that are harder to pronounce, that we would otherwise not associate with collecting rabbit droppings, hybrid hydroponics, and etching creative designs into clean animal skulls. The farm is fraught with randomness, handmade bridges that look like an otherworld set ready for installation, wooden signs, art pieces and plant theory installed. Pottery sheds, greenhouses, smoke houses, low rabbit barns, duck and goose enclosures and old fashioned bunk houses nudge up to each other like a squire town that infuses you with the expectation of seeing Bilbo Baggens appearing at the next corner. This fluffle of rabbits aren’t binky and live in self cleaning cages that need little human touch. They only casually give us attention from a bored sideways glance while they contentedly sip water and nibble on feed. Emerald green protein as shiny as a wet frogs back floats over a pond of catfish, trout and other mosquito eaters hidden beneath the slime. The fish eat the mosquito larva so the tiny biters aren’t a concern here. The slimy protein gets harvested and dried on trampolines and this aqua harvested fuel becomes feed for the animals. Checkered hens and tuxedo feathered ducks scratch and waddle among the cages of other niblings and family members. An occasional peacock call diverts attention away from the yard and up toward the bordering tree where they sit to watch for predators. Tiny black pigs that hold still to be scratched and wild colored pheasants kept inside fencing don’t appear to be wishing they could break out like many a Disney movie. Along the back of the shed sits blue barrels of garden food that are cleverly designed to maximize yield. One can take a class, stick out their tongues at neighbors once the harvest comes in, and prove that the patio is plenty ample space to stave off paying for store bought summer garden food. Tyler tells me his wife would like to tidy the yard up from its caches of this and that and then it could ultimately yield the vision from whence the whole affair began, the charm of a little village yielding an entire food supply emerging from beneath the things. Further up the hill you might find some cows roaming. There are other plans already for more barns with the sustainable yields that would come from the land. 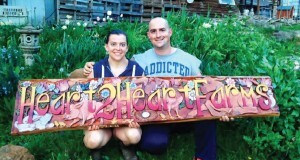 Heart 2 Heart is also a rescue farm of sorts. They take in abandoned or unwanted urban pigs, male calves and more. I considered a peacock, but then thought better than to challenge my neighbor’s sense of humor or my husband’s last nerve. They are all treated with respect and they allow folks to take or bring back “pets” if it makes sense to do so. Nothing is lost here and the word waste is nonexistent. Heart 2 Heart Farms also does most of their own harvesting of animals and it’s done with the respect and swiftness that people often speak of as a good way to die. It’s hard to find fault with the whole process at hand. Tyler speaks of wanting people to know and learn that they can reduce their own carbon footprints with just a few simple changes. Heart 2 Heart has classes on a plethora of topics throughout the year from animal husbandry to canning to medicinal herbs and more.